Collecting information from coworkers is something that many of us do every day. Whether you're chasing after sales figures, budget projections, product feedback or TPS reports, the basic business of requesting, collecting, and processing information is, well, a basic part of business. Here at Google, we use spreadsheet forms for employee surveys, volunteer lists, product feedback and managing events like team offsites. Forms chase information so that we don't have to. Send a form with simple, straightforward questions via email -- and behind the scenes, your form busily updates your online spreadsheet with responses in real-time. 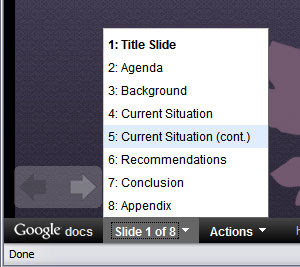 When you are giving live presentations, you now can better navigate to specific slides within your presentation. Click the Start Presentation button to launch into presentation mode. Then look for a toolbar at the bottom of the window. At any time, you can immediately jump to a different slide. We love feedback, so visit our Help Forum to share your feedback on these and other features. 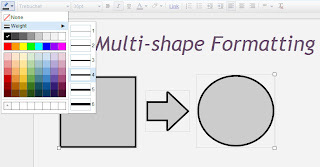 Multi-shape formatting allows you select multiple shapes and/or text boxes, and format them all at once. To select multiple objects, hold down the Shift key while you click each object, or drag over all of the objects that you'd like to select. You can then change the fill color, line color, border weight, font size, etc. Spotlight on Developers series with a look at Google Web Elements for spreadsheets and presentations. At Google I/O, the concept of "copy/paste development" was introduced in the form of Google Web Elements. For Google spreadsheets and presentations, these web elements offer a quick way to get a snippet of code that allows you to embed your document anywhere on the web. You can do this with published presentations as well. After you publish your presentation, you can go to the Presentations Elements page to enter the published URL and the size of the element you'd like. Get the snippet of code and paste in into any webpage. While you're on the Google Web Elements page, be sure to check out the other Google products that you can embed into your website. We conclude our Spotlight on Developers series with a look at Google Web Elements for spreadsheets and presentations. series with this Data API announcement. At Google I/O last week, we unveiled two new Data APIs for spreadsheets to a very excited audience. The two new Data APIs, the Tables and Records feeds, provide a structured record-based table for storing and updating tabular data in a spreadsheet. Tables can be placed anywhere on the sheet, with multiple tables per sheet and column-based meta-data for each column in the table. The Records feed is a feed of rows within a table, which we are calling records, with stable IDs (moving the rows around will maintain the same row ID). The APIs allow for creating, reading, updating and deleting records and tables in a spreadsheet. We've also improved the permissioning so that we use the same simple permissions as those given through the Share menu in a spreadsheet. Here's a simple Java demo showing the Tables and Records feed in action. One exciting and simple example of the Tables and Records feed is through an online store that's powered by Google Checkout and has inventory managed and stored in a spreadsheet. 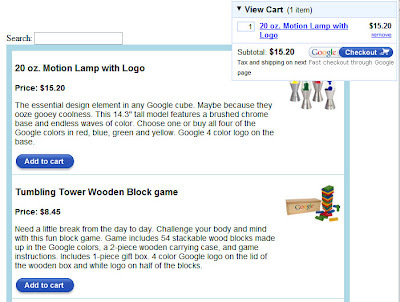 A feed of the products for sale is parsed and rendered by the Google Checkout store gadget to display a store. The Tables and Records feeds are used to communicate between the store and the sheet and the full text search is also implemented through the records feed. Learn more about building these mashups in this tutorial. We continue our Spotlight on Developers series with this Data API announcement. And if you have lots of files and would prefer to upload them all at once, then be sure to check out the Google Documents List API. 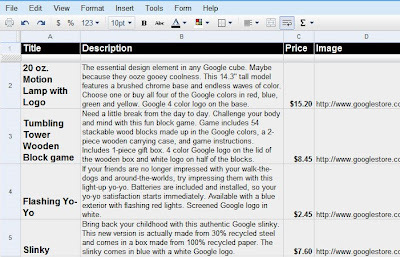 I still remember the first time I was introduced to Google Docs by a friend. I had one of those "aha" moments. Here was a product where I could easily share documents with people all over the world, and never have to worry about overlapping revisions or heavy email attachments. And with everything stored online, it meant that I didn't have to always carry around my computer or back up my files. Well, it didn't take long for me to start telling everyone I knew (and even some people I didn't!) about my experience with Docs. But there was one recurring question from my friends - how do I get my Word and Excel 2007 documents into the cloud? Today, I'm happy to be able to answer their question: we've added .docx and .xlsx to the list of file formats that we accept for uploading documents (which already included .doc, .odt, xls, .ods, .ppt, .csv, .html, .txt, .rtf, and others). 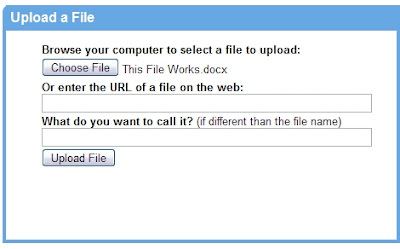 To import a .docx or .xlsx file, simply click the "Upload" button in your Docs List menu, select your file, and voila! 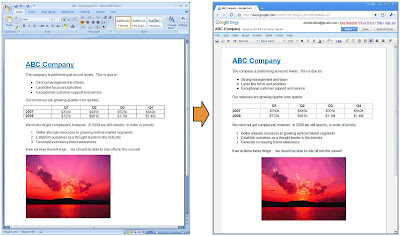 We'll upload and convert your document for use in Google Docs. This is a another great benefit of Google Docs - you don't have to worry about what format the file is in. Just upload it and we'll figure it out for you.